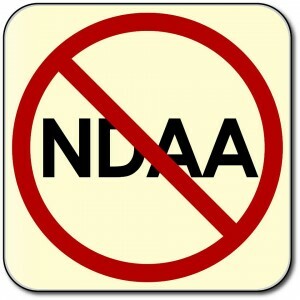 What’s all the fuss about the NDAA? The National Defense Authorization Act (NDAA) is a bill that normally funds the military. However, in 2012, two sections (1021 & 1022) made the NDAA the most dangerous law since the U.S. Civil War. Repeating the mistakes of WWII, when we detained 120,000 Japanese-Americans on race alone, this law authorizes the indefinite military detention of any person suspected of an affiliation with terrorism. This law applies to American citizens in America, non-citizens in America, and American citizens abroad. It doesn’t matter. No charge. No trial. No day in court. Passed 93-7 in the Senate, 283-136 in the House. The government just redefined a “terrorist.” It’s not someone convicted of blowing up buildings anymore. It’s everyone. According to multiple documents from the FBI, Department of Homeland Security, and other agencies, It’s people who are “reverent of individual liberty,” “suspicious of centralized authority,” and “antifederalists.” It’s people who carry cash instead of credit. It’s people who are against fracking. It’s Constitutionalists, Ron Paul supporters, Democrats, Republicans, tea partiers and occupiers. Essentially, it’s everyone. The problem is big, but there’s an easy solution. All politics is local. We’ve forgotten that. It’s time to go local. Your police, sheriff, city council, they all took an oath to protect your rights. It’s time to hold them to it. We’ve been fighting this battle for several years. And now, we’ve created the tools for you to do it too. If you’re ready to take back your town, it’s time to roll. There are 3 steps: Learn, Build, and Act. Here’s how you do it. The 2012 NDAA is the most dangerous law since the U.S. Civil War, and America’s politicians don’t want you to find out about it…using every trick in the book to stop you from understanding. Know your enemy, and you can fight it. First, you must know your public servants. Secondly, you must know your process. Research your local government; know when they meet, the rules for public comments, and how to get legislation introduced, voted on, and passed. Start small. Hand out a basic flyer to coworkers, family, and friends, and ask them to join you in defending liberty and justice. Gather a core team of at least 4 people, ready to stand with you to stop the NDAA in your community. Go to local Tea Party meetings, Occupy assemblies, and activist groups. Reach out to neighborhood groups, local parties, and activists groups. Show them how this endangers their group. Ask them to join your coalition. Meet with your representatives/commissioners/councilmen. Speak out at public comment. Videotape it. Upload the video to this website and inspire the nation. (Upload link coming soon.) The law of war is the backbone of the NDAA. Pressure your officials until they introduce, and vote on, a law blocking it in your community. Win. Get your city council, county commission, or sheriff to pass a law blocking the NDAA, protecting activists, families, and businesses everywhere in your city/county. Hold your representatives accountable. They will try to trick you. They will ridicule you. They will try to refer it to committee. They will stall. The police will refuse to enforce it. Go back. Over and over again. Never give up. If they try to weaken your law, stop them. Do not compromise. Do not accept defeat. Know that you are on the cutting edge of the revolution. That’s how we win. It’s that simple. Learn, Build, Act. You have been looking for something that works. You see the path our country has traveled down. You want a future for your children. You are ready. We’ll provide extra support when you need it. We’ll provide advice, and you have the power to take back your town. Thousands of people stand behind you. Are you ready to Take Back your town? Want to get started, but don’t quite know how? If you know how to get started, or have a lot of political experience, the above packet is all you need. Most people however, want to stop the NDAA and aren’t sure of the first step. Want some help getting started? Fill out the form below and look for an email or a call from us. We’ll help you take back your town.